If I can just get free of them I will wake up and everyone will be saved. Oh, I hate those type of dreams where you know you're dreaming but, you can't wake up. Awful. This sounds like exactly one of those. Wow, what a nightmare! Hope I never have a dream that dark. Powerful use of the wordle. First read through and I only spotted corona - because it gave me fits as to where to place it. Those nightmares where you can't wake, because you thought you were already awake. Eek! I latch onto the thing I know is wrong as my safety like the back yard out the window is shaped wrong...sometimes though I have to try several times before actually waking. Good visual of night distress. Great use of the wordles. Thanks for your visit. Maybe the next set of words somewhere will lead to another episode of my heroine :) - I like that bit of suspense. Holy cow! Sharon, this is frightening and beautifully written. Powerful write, Sharon. I love the darkness and dream qualities. It's gorgeous, and you took me there. Your imagery is fantastic. I like the flaming vessels on the lake. Retelling a dream can be difficult when things are disjointed. But the telling of this dream was well done. That's the kind of intense nightmare that will stay with you long after you wake up. Very vivid and visual writing. Whew. What a nightmare. Goodness. This is vividly told, Sharon. "crawl through the mud on a beach stained indigo"
An eerie mystic night vision brings such wildly vivid imagery, Sharon. Very well penned, my friend! Such great imagery, the willow weeping "dead snakes" and the impostor moon "nailed / Into the sky". Very powerful, that mix of impossible things and that dream "logic" that makes it make sense while it's happening. Sharon, your imagery in this is amazing. Also, love your corona use. Sharon- you have created a dream that you want to forget immediately, but your mind keeps going back to. Your use of sensory images are amazing; especially the indigo shore and the spider webs that won't let you go. 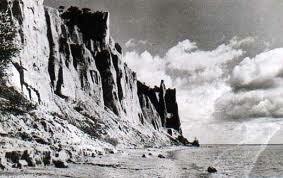 Thanks all - this came to me suddenly while I was writing a much more pastoral bit lauding my beloved Scarborough bluffs ... as I often say - the muse wants what the muse wants - well, she definitely wasn't in the mood for any pretty picture of my childhood cliffs, she was out for blood and blood she got ... I appreciate that you came, read and put in your remarks, as always very helpful.